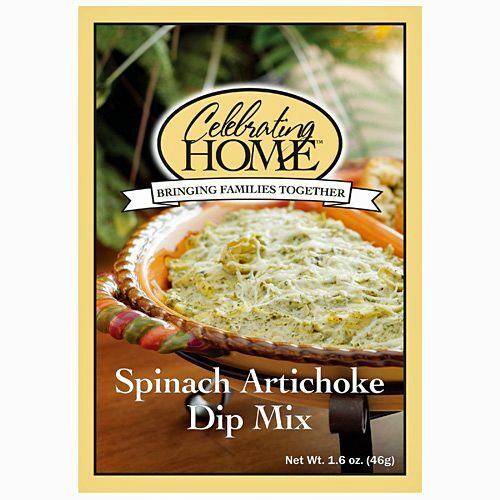 I recently had the fabulous opportunity to work with Carolyn at Celebrating Home and did a review of their Spinach & Artichoke Dip. Wow! This dip tasted so great and was so easy to make. It was very creamy and tasty! We used tortillia chips to eat ours with, but I bet any sort of cracker or pita chips would be good with it too. The package that you get for $10 makes this dip 3 to 4 times. What a great deal. The one serving we made was a large quantity of dip. You will have to try this dip! You just add sourcream, cream cheese and artichoke hearts and top with some parmesan cheese ~ that's it! Now that is easy! 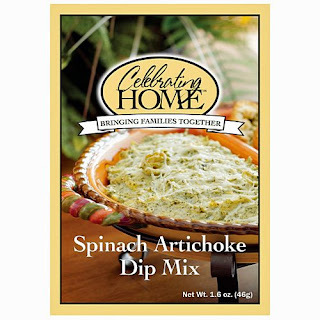 You also heat it in the microwave ~ makes it a quick dip to make and take to your parties. I have been married to my husband Dan for 21 years now. 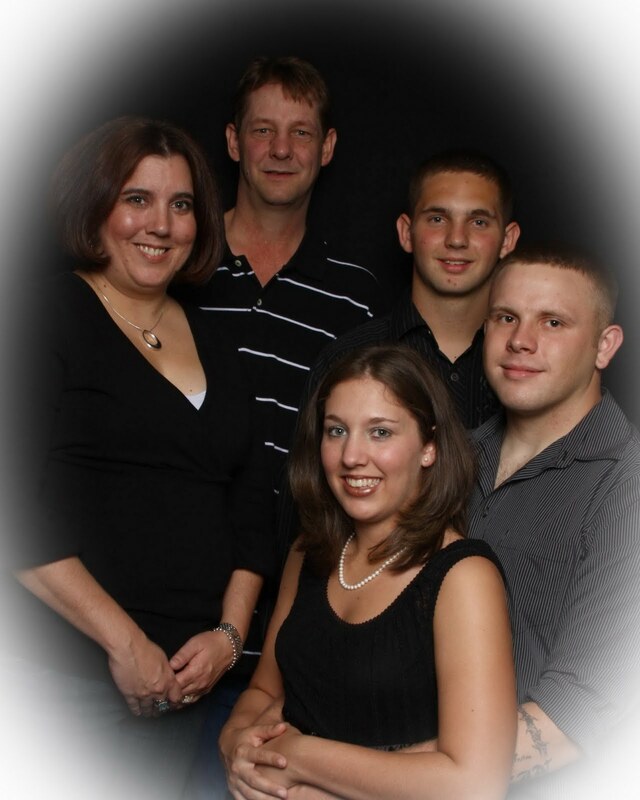 We have two kids, my daughter Ashley is 20 and my son Brandon is 17. We live in Fort Worth Texas. I have been working full time for Pier 1 Imports for 12 years. I started selling Celebrating Home a little over a year ago.I knew the day was approaching that I will be empty nesting soon and had to find something to occupy my time. I have been having Celebrating Home parties at least once a year over the past 10 years, then It finally hit me why am I not selling it?!? I really enjoy the aspect of decorating my home with great quality items. One Mommy's Moments reader will win a Dip of their Choice!! 18+ Open to USA only. Ends May 6th 11:59 p.m. Winner will be drawn randomly. All entries must be logged on separate comments to count. Follow Mommy's Moments blog via GFC! 4 Entries if you follow Mommy's Moments via email (top left sidebar). 1 Entry if you like Mommy's Moments on Facebook. 1 Entry if you follow @mommysmoments on Twitter. 1 Entry if you like Celebrating Home by Carolyn on Facebook. 2 Entries if you tell them that Mommy's Moments sent you by!! 1 Entry for DAILY per Tweet using Tweet Button at the bottom of post. 1 Entry if you follow Celebrating Home with Carolyn blog via GFC. I am also having an ONLINE PaRtY with Carolyn ~~ stop by and make a purchase for some of the great items they have at Celebrating Home. If I have a $300 party ~ an additional Dip will be given away!!! I received no monetary compensation for this post. I received the product to review. These opinions are my own. Hi. I hopped here on Nicole's Random Blog Hop, am following you via GFC, and hope you'll come follow me at Planet Weidknecht! I let her know you sent on fb. I follow on google friend connect. The dip sounds delicious! Thanks for the review and giveaway! I follow Celebrating Home with Carolyn blog via GFC. I Follow Mommy's Moments blog via GFC! I like Mommy's Moments on Facebook. I Celebrating Home by Carolyn on Facebook. I told Celebrating Home by Carolyn that Mommy's Moments sent me by!! 1 I left Celebrating Home by Carolyn a FB message that you sent me! 2 I left Celebrating Home by Carolyn a FB message that you sent me! I follow @mommysmoments on Twitter w/ katklaw777. I follow Celebrating Home with Carolyn blog via GFC w/ katklaw777. I'm a fan of Celebrating Home by Carolyn on FB. I left a message that you sent me. I signed up to get your emails!! I follow Mommy's Moments on Facebook!! I liked Celebrating Home by Carolyn and I told her Mommy's Moments sent Me!! I follow Celebrating Home by Carolyn via Google Friend Connect!! Following Celebrating Home via GFC.